Amongst the various ailments that an individual may undergo in his or her life, back pain is one of the most common. Defined as pain that occurs in any part of the back, back pain can occur at any time, can affect any individual and can be caused by several reasons. Typically, back pain occurs based on the way the bones, muscles, and ligaments work together. Pain itself is one of the common symptoms of back pain. It is also associated with persistent aching or stiffness which can occur anywhere along the spine, right from the base of the neck to the tail bone. The pain can be classified as sharp pain or a dull one, depending on the area it affects. In most cases, the pain occurs when engaged in certain tasks such as lifting heavy objects, indulging in strenuous activity, sitting or standing for a prolonged period. It also occurs in the night or along with muscle spasms, which affects the ability to stand straight. However, in most cases, back pain is a symptom by itself, which may be an indicator of secondary problems. The causes of back pain are numerous. It can range from spine related disorders such as herniated disks to spinal stenosis. Accidents and injuries can also bring about pain in the back, which can turn chronic if not treated properly. Lifestyle habits such as slouching over the desk, being overweight or excessive smoking can also lead to back pain. Other medical conditions such as arthritis, scoliosis or pregnancy can bring about back pain. In rare cases, tumours or cancer can cause back pain. Once diagnostic tests determine the cause of the back pain, the appropriate treatment will be provided. In most cases, rest and over the counter (OTC) medication are often recommended to treat back pain. Muscle relaxants, pain relievers and physiotherapy, are recommended to deal with the pain. Preventive care is also recommended to prevent the reoccurrence of back pain. 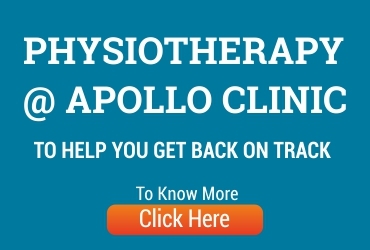 We, at Apollo Clinic, offer a comprehensive consultation orthopaedic care and non-invasive diagnostic services under one roof. As part of our services, we offer consultation with our orthopaedic specialists along with evaluation and management services. With state-of-the-art facilities and trained professionals, we ensure that you and your family are well cared for.